When it comes to increasing the number of women in STEM fields (science, technology, engineering and math) we could give you data and statistics all day, every day. For instance, although women make up half of the workforce in the United States today, they only represent 24% of the STEM world. The science and engineering fields in particular, when broken down into various strands, show that women comprise 39% of chemists and material scientists, 28% of environmental scientists and geoscientists, 16% of chemical engineers and just 12% of civil engineers. At the academic level, the numbers look promising. In the decade between 2004 and 2014, women earned roughly 49% of science and engineer bachelors degrees. So why do the numbers start to drop off once it is time to enter the workforce? We have a theory: instead of just presenting the hard data, we strongly feel that representation is everything. If “you can’t be what you can’t see”, then girls need to grow up literally looking at numerous female scientists as role models in almost every facet of life – in books, in magazines, on TV and in mainstream media. 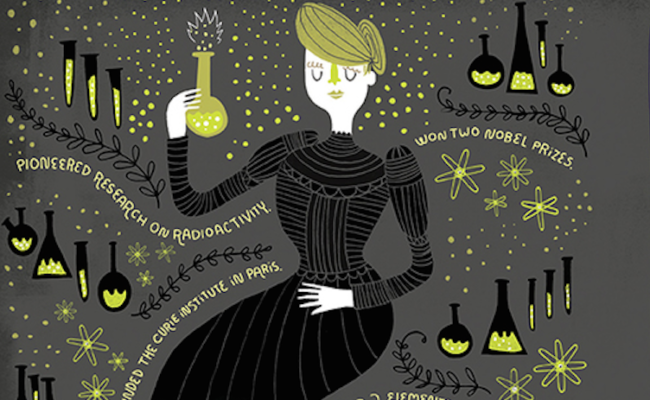 We have showcased a number of books created to inspire girls to look up to women who have blazed trails and broken barriers in the science world. In our opinion, we need more of these kinds of books offered to young girls to counteract the many stereotypical tropes about princesses, falling in love, and girls who find success and happiness based solely on their appearance and ability to find a husband. 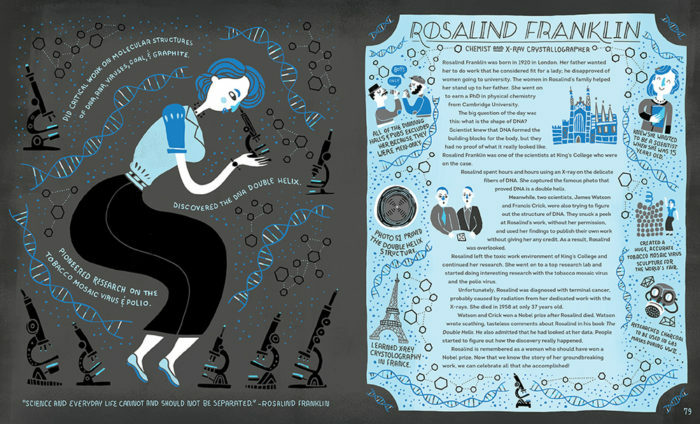 A new book by author and illustrator Rachel Ignotofsky, a Kansas City, MO native whose work is inspired by history and science, has released a book that will give readers a chance to immerse themselves in both the ancient and modern history of female scientists who aren’t as common knowledge as Einstein (yet!). 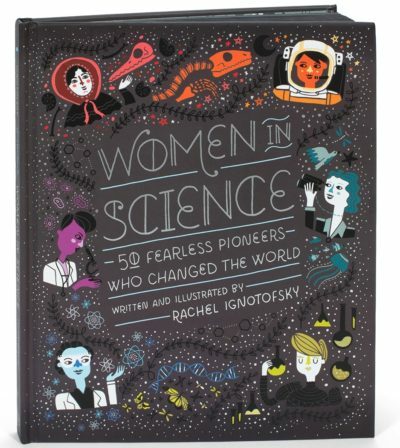 ‘Women in Science: 50 Fearless Pioneers Who Changed The World’ is Rachel’s first book and cover a vast range of women in the science, engineering and math field, including primatologist Jane Goodall, as well as lesser-known pioneers such as Katherine Johnson, the African-American physicist and mathematician who calculated the trajectory of the 1969 Apollo 11 mission to the moon. There are names of women even we hadn’t heard of before, proving how vital a resource like this is in the world of STEM education! 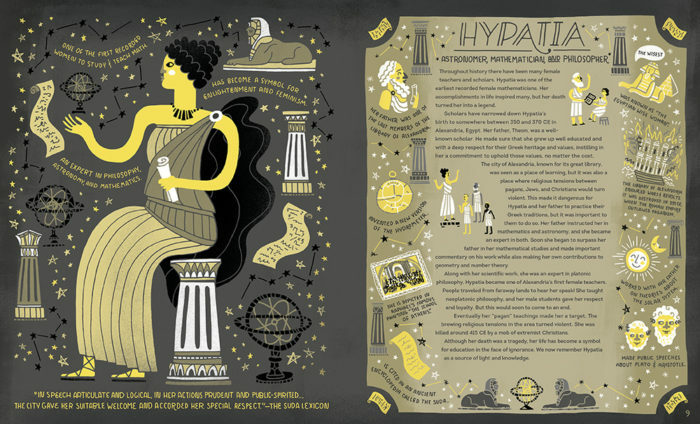 Fourth century ancient astronomer, mathematician, and philosopher Hypatia, and Iranian mathematician Maryam Mirzakhani who recently became the first woman to win the highest medal in mathematics, are part of this awesome book. And the coolest part about each woman’s profile are the accompanying illustrations Rachel created. 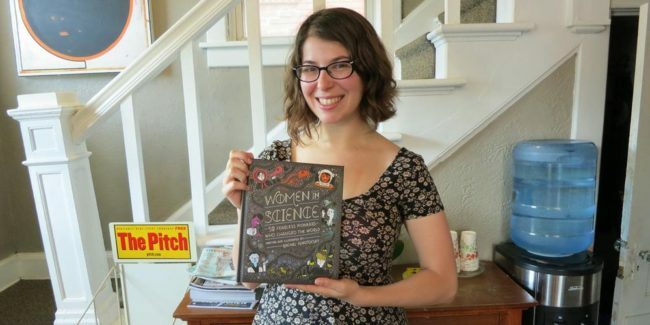 In an interview with Geekdad.com, Rachel says the inspiration for her book came from having a number of friends who work in education who she would talk to about the low number of women in STEM fields. From an early age, because children aren’t being taught about female scientists at the same rate or prevalence as the male scientists, it is seen as a “man’s job”. “Statistically, girls are not going into STEM fields. They aren’t graduating and getting STEM jobs. Why are science and math seen as a boy’s club still? I thought it was just because we aren’t taught about [women in science] in school. 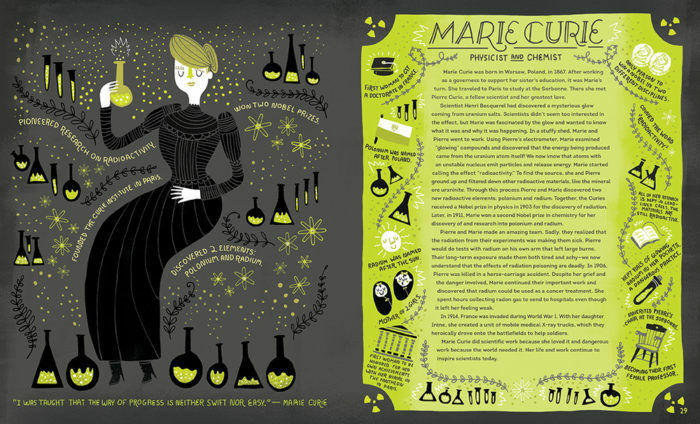 I don’t remember being taught about anyone other than Marie Curie when I was in school. Or maybe in women’s history month you learn a little more. But after that, it’s like … it’s mostly guys you learn about,” she said. She also knows that visual representation and role models from a young age can help change a child’s mind about certain industries, especially girls who are taught to think a job may not be for them simply by the visual and social cues they subconsciously digest daily. “I think that by having a bunch of strong female role models by making that information fun and cool and easy to interact with and accessible, people could start to change their minds about what they’re capable of and by pointing out women, kids can say ‘I want to be like you when I grow up.’ I think that’s really important,” said Rachel. When we see the 50 women included in this book, we also can’t help but feel everyone would benefit from knowing some of the amazing things these pioneers have done. Hedy Lamarr, a former actress who is credited with invented the technology now used in modern wi-fi and bluetooth, also helped develop a radio guidance system for torpedoes during World War II. Rita Levi-Montalcini hid in the mountains of Italy during the time Mussolini’s was in power. The holocaust was happening at the time, and being a Jewish woman, she knew Jews were forbidden from working in the sciences. In her hiding place she used knitting needles to dissect chicken eggs and her continual research on embryonic chickens led her to discover the nerve growth hormone. In the introduction of the book, as shared by Brainpickings.org, Rachel describes the badass spirit exhibited in many of the women, including Barbara McClintock, a woman who dared to wear long pants at the University of Missouri at a time it was deemed un-lady-like. 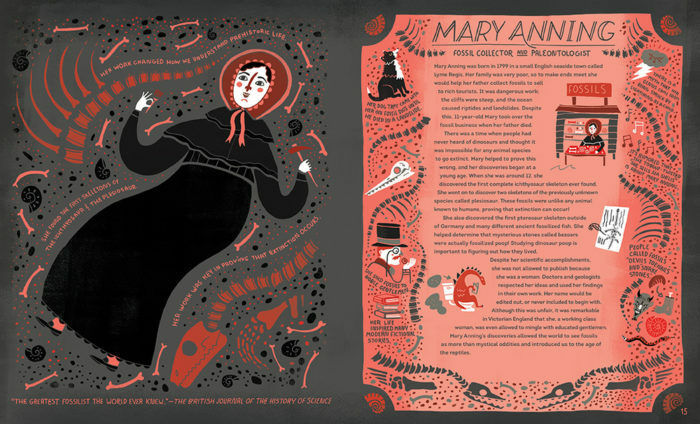 Her ground-breaking work at Cornell University in the field of genetics where she mapped chromosomes using corn (she eventually went on to discover jumping genes), was overshadowed by the culture in the 1930s which saw her ostracized by the male faculty members and excluded from research support because of her gender. She eventually went on to win a Nobel Prize and change the way the world studies genetics, which is the kind of story we all need to know about. What would current genetics studies look like today if someone like Barbara did not choose to defy the status quo and forge ahead with her work? “Barbara McClintock’s story is not unique. As long as humanity has asked questions about our world, men and women have looked to the stars, under rocks, and through microscopes to find the answers. Although both men and women have the same thirst for knowledge, women have not always been given the same opportunities to explore the answers,” Rachel writes in the introduction. If you are looking for a great resource to share with your own children, your school, your family, or just to educate yourself about more incredible women to dare to change the world, you can find links to purchase ‘Women in Science’ on Amazon, Barnes & Noble, Google Books, iBooks and Indiebound all on Rachel’s website. “I get messages from moms and dads who decorate their nurseries with my posters, so kids will grow up asking who these people are, so I can help make them a part of everyday life. So now, there’s a nursery somewhere with Rosalind Franklin and Valentina Tereshkova on the wall. That’s amazing! That kid is going to grow up and say ‘Oh, Valentina Tereshkova was the first woman in space.’ Think about that, how having female role models can transform the world we live in and what we think is normal,” she said.